Version blog ...be the first to know whats coming! Touch ID will make it easier to protect your data from prying eyes. Rewritten the Core data stack. Fixed database migration issues for users who have been using the app for a long time (> 2 years). Touch-ID support will be released in the next version, implementation not yet completed. Support for the large, beautiful, screen of the new generation iPhone devices. Problems occuring when editing and deleting transactions. Bug when categories were sorted. The new sorting order did not persist. TouchID and iPhone 6 support will be available in version 1.2004. Refreshed flat design that matches iOS8. Follow us on Facebook to get glimpses of the new design! Thanks to every single one of you who have reported this issue. The problem happens on iPhone 5 with iOS7. When you type something that starts the autocompletion feature, the app shuts down. Thanks to the powerful new crash-reporting feature we have added to the current version of MyWallet+ we instantly got thousands of reports of the error and could quickly locate it and fix it. We’re working really hard to bring you the next version of MyWallet+. I know alot of our users are unhappy with the current design of the overview and the slow pace of updates. I read every single review the app gets. I have understood that the main critique is that its hard to read (small type) and that it looks particularly bad with currencies that have alot of decimals. To address the slow pace of updates I have adopted a new testing and source control system that makes it really easy to ship new features. Since we cant respond to AppStore reviews I want to ask from every single one of you to send your feature-requests directly to us via e-mail (support@block21.com). And finally – to all of you reading this, I want to personally thank you for choosing our app. I am humbled by the massive response and the following of truly awesome people! I have got literally thousands of e-mails from users all over the world telling me how MyWallet+ has changed their financial lives. It cheers me up every single time! Thanks to you MyWallet+ is one of the most downloaded finance apps on the AppStore. Sorry for the delays, there are alot of changes in MyWallet+ coming this fall/winter, we have been working hard on building a new version of the app in parallell with the existing version. Reminder: The drill-down function in the overview is still there, just press the icon instead of the bar to see underlying transactions. Enough is enough. We love our users. We want the best for you. We believe that all sensitive data needs to be backed up, but a lot of users disregard this and when trouble happens, they are in for at messy procedure of restoring data from iTunes backups. Although we do our best to help you restore your databases, it is often frustrating and stressful when it happens. We want you to feel safe with our app. This is of paramount importance to us. That is why were introducing an automatic backup feature in the next version. It will silently, and automatically, make backups of your database on a daily basis. We will probably limit it to 5-10 simultaneous backups, which means that the oldest backup is continuously pushed out. This is to ensure that you NEVER EVER again loose your data due to bugs or to any misfortune. We have had our share of database issues in the last few versions. The reason for these issues is that under the surface, there are huge changes in the apps database. This is due to the amount of feature requests we get, and frankly – if we dont grow and add features – we might aswell stop developing. We have expanded the database to support budgets, labels, reports and a dozen of other features we have planned for this year. Database migrations are always difficult, especially since we have so many users that are running so many different versions of the app on a wide variety of devices. It is finally time to reveal the financial analyzer! We’ve been working with this feature for some time and its ready to be released. A lot of users have requested all kinds of visualizations of their data. Bar charts, pie charts, comparisons etc. We have been sceptical to showing graphs mainly because it is really hard to fit a good looking and USABLE graph into an app in portrait mode. But we think we’ve figured out how to do it. 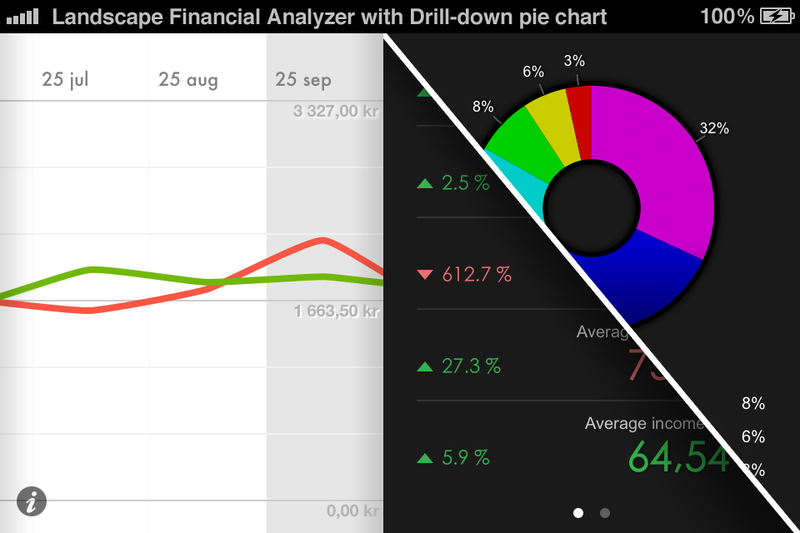 Here is a short video clip of the pie chart component that we’ve developed for the Financial Analyzer. ..into: Norwegian, German, Spanish, French, Dutch, Russian, Portugese, Italian, Japanese, Korean, Chinese, Danish, Finnish, Hungarian.